Orange zest is a fragrant, delicious way to pump up the flavor in sweet and savory recipes. These tips, tools and how to use it suggestions will make you a pro (also works with lemon zest and lime zest). Orange zest, along with lemon zest and lime zest, is an ingredient in everything from cookies to the Sweet & Spicy Slow Cooker Beef Stew recipe I shared this week. It’s a vibrant flavor addition to any recipe or to prepared foods. 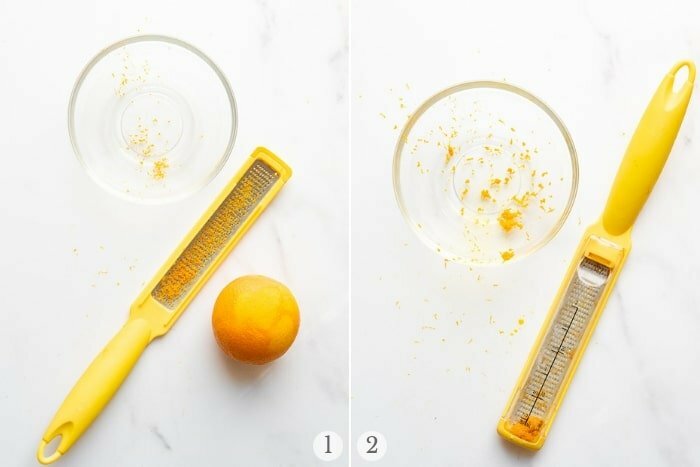 Today I’m sharing a full breakdown of what it is, how to zest an orange (or any citrus fruits), my favorite tools and a bonus! 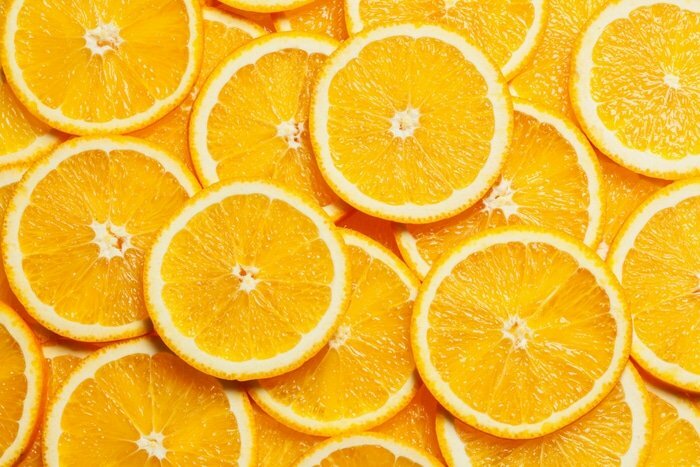 Orange zest is the colorful outer peel of the citrus fruit (orange zest, lemon zest or lime zest) which releases flavorful oils with the tiny bit of peel. Orange zest adds even more of the fruit’s flavor to a dish. The zest is strong in fragrance and flavor and just a small amount can deliver fantastic flavor (different flavor than the juice does). When a recipe calls for ‘orange peel’ it requires the outer colored portion of the fruit peel AND part of the white area below. The zest is ONLY the colored part. 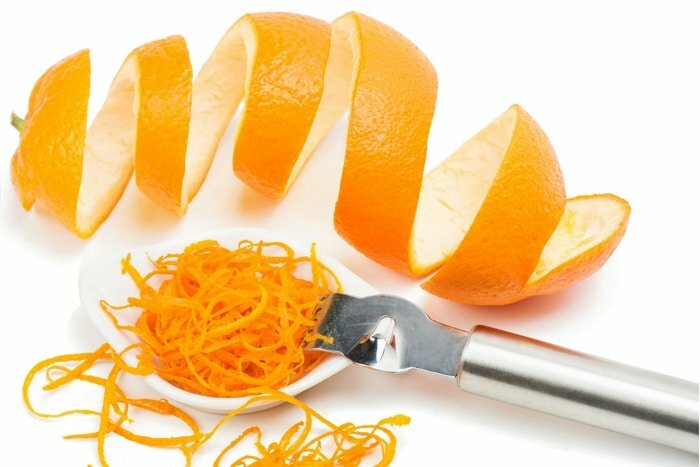 ‘Zesting’ is the process of removing the orange zest from the fruit. 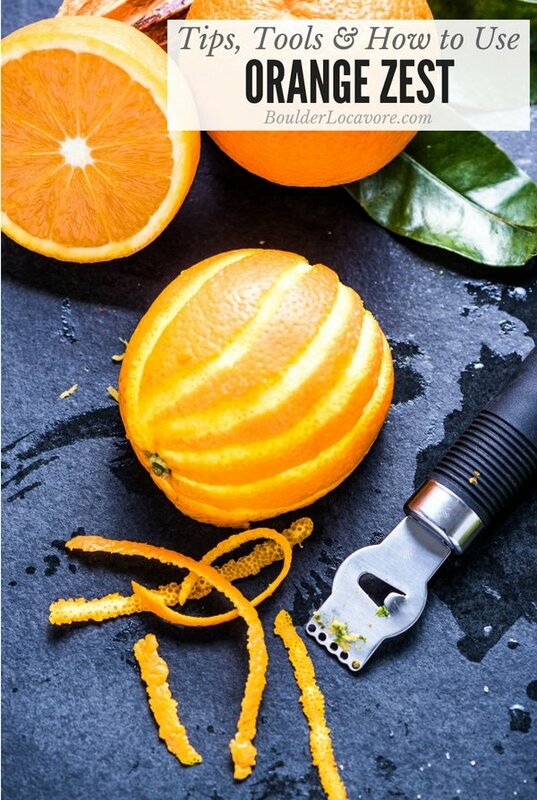 Using a zesting tool, or a ‘zester’ is the most common and easiest way to remove the zest from the orange. Always start with a rinsed/clean, dry orange. Using a Zester (see below for types) lightly grate the outside of the orange into a bowl, only removing the outer colored portion of the peel. What to Avoid: Zesting too far below the outer peel can penetrate the pith, or the bitter white portion between the outer peel and the fruit. You don’t want that. There are many types of zesters and in my opinion, it’s worth having as part of your kitchen arsenal. They are not expensive and you’ll use them often. Though a paring knife may also be used it’s more difficult to only release the zest and in the typical grated texture most recipes are seeking. 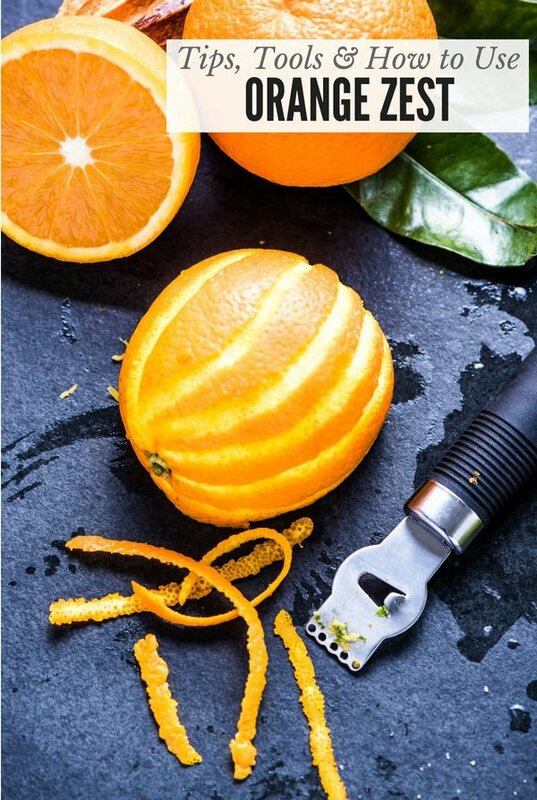 This type of zester usually has 5 small holes in a metal tool that is pulled across the citrus fruit to create strings of zest (refer to top title image). The zest is not as fine in texture. The bonus to this type of zester is the Channel Knife. This part of the zester allows creating long strings of zest usually used for cocktail garnishes. It’s also perfect decoration on top of prepared sweet or savory recipes. A microplane-style zester has a long narrow metal piece covered with tiny holes with a small blade in each, attached to a handle. 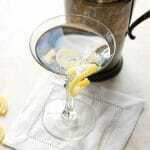 When the citrus fruit is dragged across the surface, the zest comes easily off in a finer texture. It’s a perfect type of zester to quickly grate zest into a recipe. Usually the same microplane can be used for grating cheese and other items as well. I have both a traditional microplane and this IQ Better zester which I love! I have seriously given this zester to several friends and family members for gifts and feature it in my Amazon store. In photo 1 above you can see what the zest looks like, but normally I would be using it as in photo 2; with the cover on. 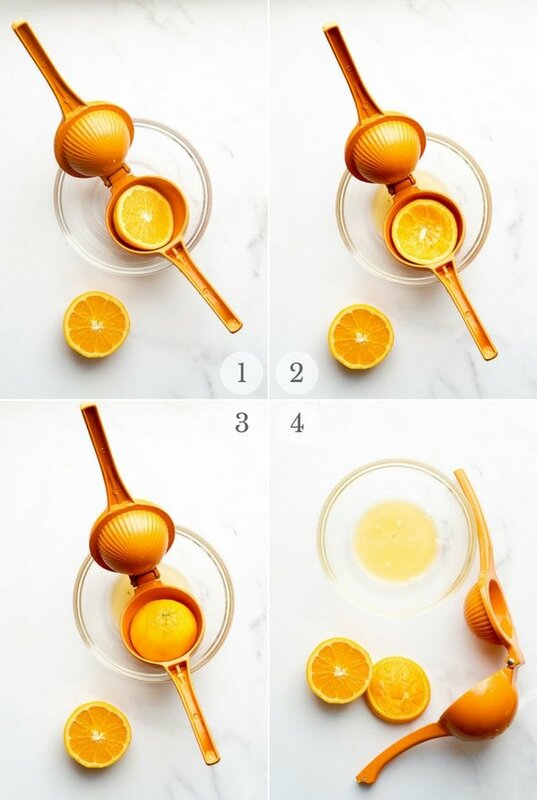 It prevents a mess (no bowl needed or situation as seen in the photos) and lets you know how much zest you have without putting it into measuring spoons. The zest is delicate and can be moist, making transferring to measuring spoons messy. Orange zest may be used in recipes or my kids add fresh zest to yogurt even. Add orange zest anytime you want to punch up the fresh orange flavor without adding liquids. Sauces. Use it to deepen the orange flavor. Salad dressings, pan sauces, or condiments like this Bacon Jam recipe. It’s a favorite ingredient of mine in Fresh Cranberry Orange Sauce. Baked Goods and Sweets. It adds a great citrus flavor without changing the balance of the ingredients by adding orange juice. It’s great in a glaze to top baked goods like Coffee Cake Muffins. Add it into a sweet treat like Orange Kettle Corn (perfect for Halloween btw) or Orange Curd. Savory Recipes. The citrus flavor from orange zest is great with meat. Recipes like Slow Cooker Caribbean Pot Roast are enhanced and made more interesting by adding the citrus flavor from orange zest. Salad. It’s a simple way to bring unique flavor to tossed greens or fruit salad. Refridgerator: sealed in an airtight bag or container for 1 week. Freezer: sealed in an airtight freezer-proof bag for up to 1 month. Now that you’ve zested your orange, you might as well juice it! As with zesting there are many types of juicing devices for citrus fruits; including squeezing it with your hands. My FIRST TIP: if using BOTH the zest and juice of a citrus fruit in a recipe, zest the fruit first then juice it. My SECOND TIP: (after zesting if you are zesting) place the citrus fruit in the microwave for 10 seconds. The fruit will release more juice when you juice it. I love an old school glass juicer/reamer but what I use the most is this handheld Citrus Juicer. I have one for oranges, lemons and limes. There is a great trick I learned when I took a salsa making class in Santa Fe I am going to share with you too! STEP 1: Place half the orange into the juicer with the curved sides touching (what looks like the ‘normal way’); photo 1. Squeeze the juicer to release the juice into a bowl (photo 2). STEP 2: Flip the orange over (the ‘wrong way’) so the fruit is facing the curved side of the juicer (photo 3); squeeze again into the bowl (photo 4). 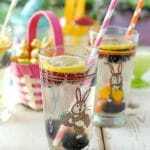 You’ll get so much more juice from this double juicing approach! Do you have a favorite recipe or food using Orange Zest? Leave a comment below and let me know what I absolutely must try! Zesting is a great way to add extra amazing flavor to many dishes. Thanks for sharing the great tips. 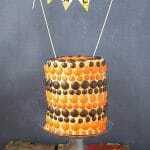 I love zesting any citrus fruits and and making strips for fruit cakes etc. Making my own fresh candied strips for baking! Flavor so much more intense and fresh! I have actually never done an orange zest before or any zest for that matter. this post was such a great how-to for beginners just like me. Becca! You’ve just stepped into a whole new world of flavor. Inexpensive, fresh and fantastic. I’m excited for you! Thanks for these great tips. I need to get one of those zesters you recommended. I love the added flavor that zest brings to a dish. I never would have imagined being ‘excited’ about a zester. But this one really makes things so easy!! This looks awesome and adorable! Absolutely a must have, this is a winner! What a fun and helpful post! 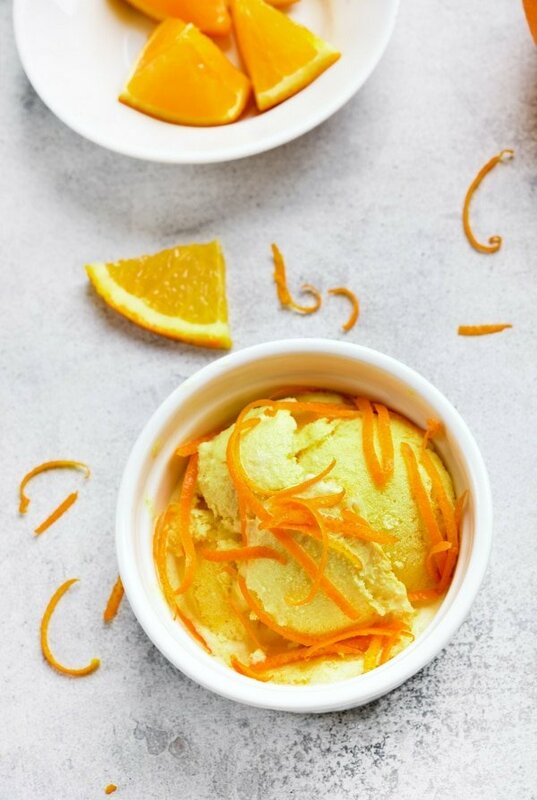 I LOVE citrus zests and cannot imagine culinary life without them! I have a zester and have never quite known where to stop with the zesting. This is really helpful. There is nothing better than the smell of orange zest! It’s so useful in so many recipes! OMG this is awesome! I love it! 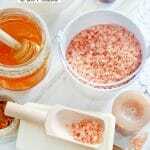 I LOVE orange zest and had no idea there were so many ways to get it and uses for it! You reminded me that I actually need to invest in a good zester. I always have to use my grater to get some zest but that is about to change–finally!! Wow you shared so much information about orange zest. I never realized the difference between the zest and the peel. Now I know exactly what orange zest is. Thank you for sharing this cool information. Do you think this was an over share Bill? Lol! There’s more to orange zest than meets the eye but now you know it all! It would definitely by fun to use zest more often in desserts. I may have to give that microplane zester a try. It would make it easier for me! Can I confess? There have only been a few kitchen gadgets I’ve gotten this excited about. This zester is SO easy and fast to use. It does make you zest more often. Oh I love this guide. And orange zest is perfect in so many recipes. This is such a fantastic how-to post! Perfect timing for fall! great info!! I need to get a zester channel knife!! Thanks! I LOVE using orange zest in cooking! I’m a big fan of it in everything from cookies to pork and chicken. It’s so versatile. I have a zester that I use, but mostly just for lemon zest. I will have to try orange zest one of these days.